Meow! has new neighbours. We'd like to welcome The Guelph Civic League to the neighbourhood. The Civic League is a non-profit organization devoted to better city planning, support of local businesses, heritage conservation, and ecology. They have new office space right above Meow!, in the upstairs part of our building where Beadazzled used to be. 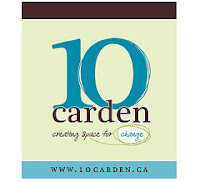 The office space is officially called "10 Carden" (our shared address) and is available for rental or use as meeting space for local groups. It's billed as "A Space for Change." Just like Meow!, it is a beautiful heritage space, right across from City Hall and with lots of potential for our community. Check out the links above for a sneak peak and loads of background info. Photos here.